Parents may not realize it, but their soccer-playing kids may be exposed to a hidden danger every time they take the field, a danger that could hurt or even kill. The Early Show consumer correspondent Susan Koeppen explained Thursday that portable soccer goals are inherently top-heavy and can weigh hundreds of pounds. If they're not anchored properly, or at all, they can tip over with relative ease, putting nearby players at risk. The U.S. Soccer Federation says 14 million kids aged 6-17 play the sport in this country, with up to 500,000 goals in use. Soccer goal tip-over accidents kill at least one child every year, and injure 200, according to the Consumer Product Safety Commission. Unlike professional soccer, which uses permanently-anchored goals, youth soccer typically uses goals that are portable and can be moved on and off the field. Schools and parks prefer them because they enable more than one sport to be played on each field. The CPSC's Julie Vallese told Koeppen, "Everyone who visits a field needs to understand that (soccer goals) are big, they are heavy, and the misconception is that they won't fall over because of that." 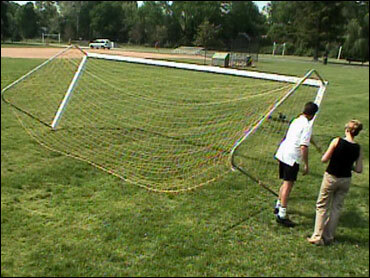 Soccer goals are sold with anchoring systems, usually sandbags or metal spikes. Under national youth soccer regulations, referees are supposed to check that goals are properly anchored before every game, but no one supervises the refs to make sure that happens. The regulations also say goals should be anchored before every practice and scrimmage, but that safety measure is often ignored, as well. And that, advises Koeppen, is key: parents or kids should check goals themselves before games or practices to make sure they're anchored securely. Also, kids shouldn't help move goals, because that leads to many accidents. And kids should never hang from them, since that leads to many tip-overs. Even the wind can cause the goals to tip. The organization responsible for creating voluntary safety standards for soccer goals, the American Society for Testing and Materials, is considering stronger stability standards for new soccer goals. The improved standard would require unanchored goals to stay upright even if two 10-year-olds are hanging off the center crossbar. There's no timetable for when these new standards might be passed. Koeppen spoke exclusively with the parents of a 10-year-old goalie who lost his life last month when a goal fell onto him. She also chatted with a father and daughter about a similar incident that severely injured the girl's leg. Both families Koeppen visited have other kids who play soccer; they've taught their children to check the goals before they take the field to make sure that the goals are anchored.